Heat oven to 350°F. Lightly butter 13x9-inch pan or spray with cooking spray. If using crescent rolls: Unroll 1 can of dough into 1 large rectangle; place in pan. Press in bottom and 3/4 inch up sides of pan to form crust, firmly pressing perforations to seal. If using dough sheets: Unroll 1 can of dough; place in pan. Press in bottom and 3/4 inch up sides of pan to form crust. 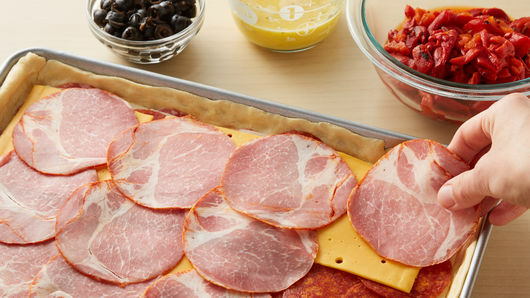 Layer all meats and cheeses in order listed over dough. In small bowl, beat 2 eggs, the garlic powder and pepper with wire whisk until well blended. Pour over meat and cheese layers. 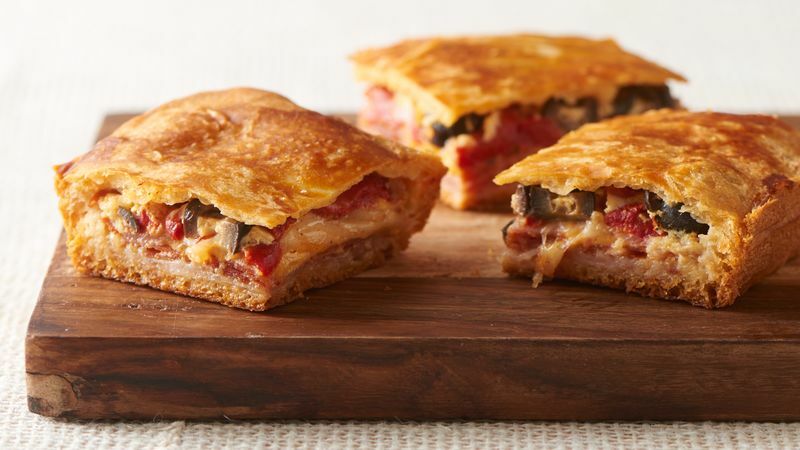 Layer roasted peppers and olives over top. If using crescent rolls: Unroll second can of dough into 1 large rectangle; press into 13x9-inch rectangle, firmly pressing perforations to seal. 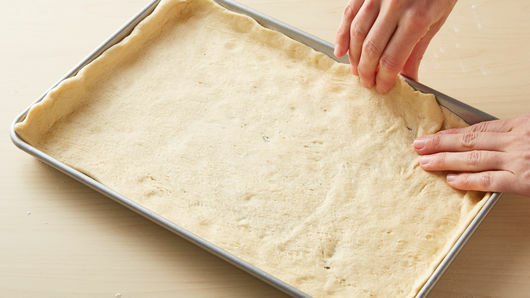 If using dough sheets: Unroll second can of dough; press into 13x9-inch rectangle. Place over top of layered ingredients. Pinch edges to seal. 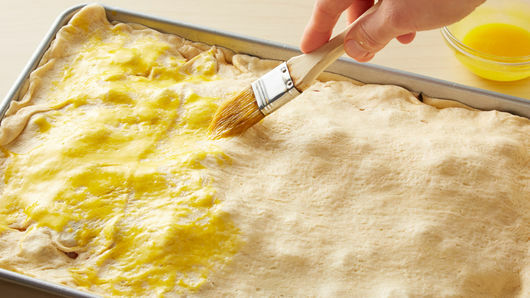 Brush beaten egg yolk over dough. Cover with foil. Bake 30 minutes. Remove foil; bake 15 to 20 minutes longer or until deep golden brown. Cool 15 minutes before serving. Cut into 6 rows by 4 rows. Serve warm.